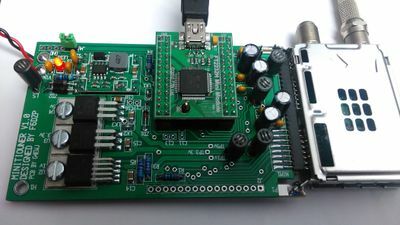 The original MiniTiouner hardware launched in 2015 used a PCB designed by Brian G4 EWJ to enable easy home construction of the MiniTiouner hardware and components for over 200 units have been sold around the world. The version 1 PCB was designed for use with the Sharp and Edeartek tuner NIMs available from the BATC shop in 2015 and 2016. Due to the Sharp NIM going obsolete, from Jan 2017 the BATC only sells a NIM from Serit. However, as the pinout is different from the Sharp NIM, a simple adapter board is required to enable the Serit NIM to be plugged in to the original MiniTiouner PCB. Brian G4EWJ has designed a PCB and the blank board and the Serit NIM is available in the BATC shop. You only require the adaptor PCB if you are upgrading a MiniTiouner version 1 hardware to use the Serit tuner. Any new constructors should use the version 2 board which will not need the adapter PCB. Serit FTS-4335 - Sold by BATC shop in 2017 but with different pin out so needs the adapter card. When you have built your MiniTiouner, you can check it using the software "TestMyMiniTiouner" included in the Minitioune software package. This page was last modified on 20 July 2018, at 00:21.